Hectic, restless and bursting with life, Ho Chi Minh City’s heady combination of street food and skyscrapers is an assault on the senses. The traffic is not so bad on the weekend!” says Troy, Ho Chi Minh City resident and my guide for the day, without a hint of irony. We’ve been sitting stationary at a bottleneck junction for 40 minutes to the soundtrack of indiscriminate beeps from surrounding cars – a reflexive action and benign warning to motorbikes competing for inches on the tarmac. It seems the city’s 8.6 million population busy themselves on this narrow stretch, but this is a slow Saturday in Saigon. Traffic light tangles eventually make way for wide boulevards, tall trees and neoclassical buildings and we step out of the car into the midday heat. After passing towering glassy banks, glitzy hotels and designer boutiques, we reach the War Remnants Museum; its moving array of displays, military planes and mock-ups of old jail cells a stark reminder of the struggle to reach today’s peace and prosperity. Just around the corner, the pale-yellow post office, ornate opera house and city hall (reclaimed with a 24ft statue of Ho Chi Minh at the front) are vestiges of the colonial French, who left after the First Indochina War in 1954. The faded red Notre-Dame Cathedral was brought brick by brick to Vietnam from Toulouse and while its silver bell towers may have been imposing in the 18th century, these days they are dwarfed by surrounding skyscrapers. Off the main square, life ticks by as it always has done. Finding shade beneath tropical trees in the 5-hectare Tao Dan park, men look after caged birds, elderly residents practise tai chi and uniformed kids play games. At nearby Ben Thanh Market, wads of fake money to burn for ancestors are sold on every corner, and in the warren of backstreet stalls people worship at small pagodas between picking up groceries. But despite relics of darker times and long-practised traditions, there’s a firm eye on the future; throughout the city, fenced areas mask ambitious building work for a (long overdue) Metro and Landmark 81, a skyscraper set to be the tallest building in Vietnam. After a long (and hot) day sightseeing, I’ve worked up an appetite and join the halting traffic on a Vespa street food tour. My driver, Trung grew up in Saigon and deftly navigates the roads, finding opportunity in barely perceptible gaps, weaving narrowly between wing mirrors and making relaxed conversation while tilting within a hair’s breadth of the curb. After peeking from behind my hands as he speeds past knots of motorbikes wrapped around ring roads, I emerge from my helmet grinning from ear to ear at every stop. While he drives, it’s Jenny, a chirpy student born and bred in Ho Chi Minh City, who leads my culinary journey one district at a time – from shiny cocktail bars with skyscraper views to small cafés with trailing queues – catching up like old friends each time we sit down. At the local’s favourite place for banh xeo (crispy Vietnamese pancakes), busy chefs spin countless crepes in a sweltering open-air kitchen, arms darting from pan to sizzling pan in a well-practiced routine of ladles and flips. Following Jenny’s lead, I pull off part of the enormous pancake, spoon in sweet chilli salad and beansprouts, sprinkle in mint and mustard leaves and wrap the whole thing in lettuce. She waits in anticipation as I take a sizeable mouthful, “do you like it?” she asks. I nod, hoping my enthusiasm makes up for a lack of grace. For our penultimate stop, we swing off the busy main road and past the raucous karaoke of a spirited group on small stools, to a quieter district. At a modest café, myriad dishes are squeezed into every inch of the red vinyl tablecloth; mushroom and tofu spring rolls, hearty vegetable hotpot, cauliflower doused in a sesame sauce, guava with chilli salt, and mountains of Singapore noodles topped with morning glory (green beans fried with garlic and chilli). I look down at the banquet and Jenny leans over seriously, the image of discretion, “if you’re still hungry I will order you more food, it’s no problem”. Rounding off the feast with fresh coconut ice cream and a strong Vietnamese coffee at a live music venue, I’m not sure I’ll ever find room to eat again. Keep an eye out for part two of Georgia’s Vietnam adventure where she swaps Saigon for the island idyll of Phu Quoc. See yourself city slicking in Saigon? Get in touch with our Southeast Asia experts to start planning your trip to Vietnam. This article was originally published in issue 8 of east, our travel magazine. 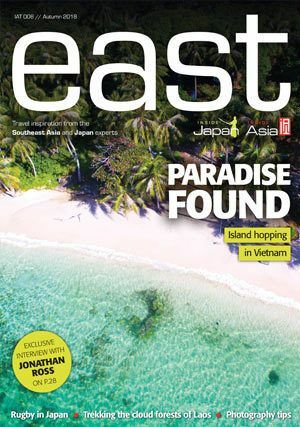 To keep up to date with the latest travel inspiration and features from Japan and Southeast Asia, sign up to receive east twice a year through the post for FREE!